If you're tired of mechanics trying to sell your repairs that you don't really need to just increase their bottom line, you've come to the right place. Coppell Mobile Auto Repair is committed to fair, honest pricing and repairs to guarantee your satisfaction. ​When it comes to mobile auto repair, Coppell Mobile Auto Repair, is the company you need! We save you the inconvenience by driving to your vehicle at home, work, or on the road. Not only are we extremely convenient and professional, but we are also competitively priced! 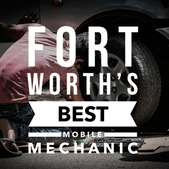 When it comes to quick and convenient auto repair, Coppell, TX. is our home! Save money with no towing charges, car rental fees, or lost time delivering your auto and waiting around the repair shop! We are a family owned and operated business. We take pride in providing honest, high quality, dependable auto repair service to our Coppell, TX. customers. Our company stands on sound business principles and upholds high ethical standards. Coppell Mobile Mechanic : 682-847-7898​ Mobile Mechanic Coppell, TX.